Since 1989 Jane has been fascinated by small groups of musicians performing. 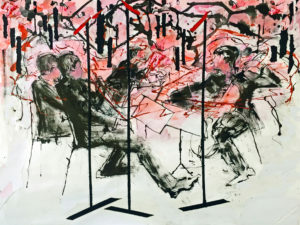 She spent a weekend drawing at the Barbican as different groups of musicians played all the Haydn string quartets; by the end of the weekend she was hooked and has been exploring the subject ever since through drawing, painting and collage using a variety of media. 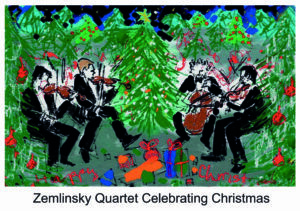 Jane turns her paintings into cards and a special request was made for a Christmas card with a musical theme this year too, so Jane has created a painting from a performance by the Zemlinksky String Quartet. All of her cards are available to buy at the Friends table at every Leamington Music concert and the proceeds of all card sales go towards the Leamington Music Education Programme. 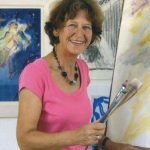 Do visit Jane’s website and follow her blog; you can see some of Jane’s artwork at the concerts and her book ‘A Musical Journey in Paint‘ is now available on Amazon.